In this series I have been highlighting Paul’s commands to the churches that are of a particular structure. The structure is called continuous active imperative. These are commands for the church to (positively) keep doing what it is supposed to be doing, or (negatively) to stop doing what it is not supposed to be doing. 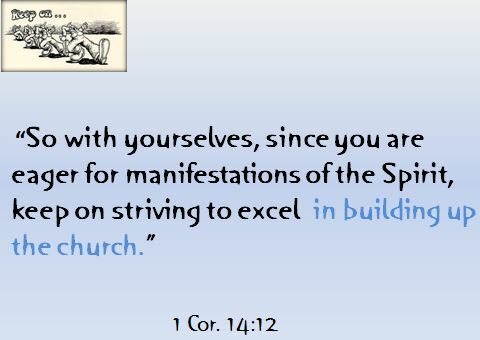 The command in today’s text is in verse 12, where Paul encourages the Corinthians to keep striving to excel in building up the church. The context of this command is chapters 12-14 of 1 Corinthians. Let me try to summarize what Paul is saying in these three chapters. Chapter 12 is about Spiritual Gifts. He says there are going to be all kinds of gifts manifested when we gather together, because the body of Christ is made up of many different members, with many different ministries assigned to them by the head (Christ) and empowered by the Holy Spirit. He does encourage the whole church to earnestly desire the higher gifts, which are the ones which build up the most members of the body. 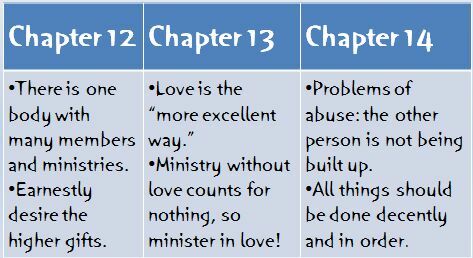 Chapter 13 is the love chapter. Here Paul encourages all ministry to be done out of love, otherwise it counts for nothing. In Chapter 14 Paul addresses some examples where it appears the Corinthians are not doing that, so spiritual gifts are becoming a problem. They were being abused, and the result was chaos rather than order. Now I want to summarize chapter 14 with a little more detail. This is the chapter in which our text for today is found, so it is important to put as much flesh on it as possible. 3) some of the women of the congregation were speaking, and, for some reason that too was causing disorder. I want to comment on each of these problems, and I want to talk about the simplest problem first, then go to the ones that are more complex. The simplest problem Paul mentioned was that everybody was jumping up to speak all at once, and the result was chaos. People didn’t know who to listen to, and very little edification was getting done. It was a free-for-all, and probably resembled a competition to see who could gain the most listeners. The confusion was being caused by a good thing: the Corinthians were eager to share. 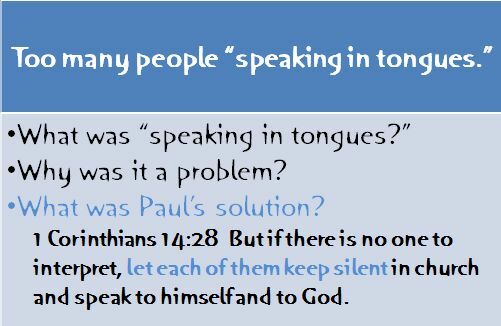 Paul encouraged them to be considerate of one another and limit the number of people who speak, and have only one person speak at a time. Be considerate. Problem solved. 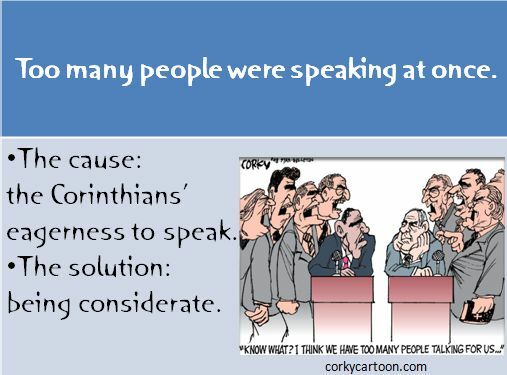 Another problem that Paul brought up in 1 Corinthian 14 is that some of the women of Corinth were speaking at the assemblies, and that was adding to the disorder. Some people believe that God has only ordained men to speak in church services, but I do not think that is the case. I have already shared how Gal. 3:28 shows that all Christians have the same status before God. Also, Joel 2:28-29 predicted a new era of the Holy Spirit’s ministry would include prophesying by both “sons and daughters.” That new era began at Pentecost. So why is Paul preventing the women to speak here? Verses 34-35 hold the key. 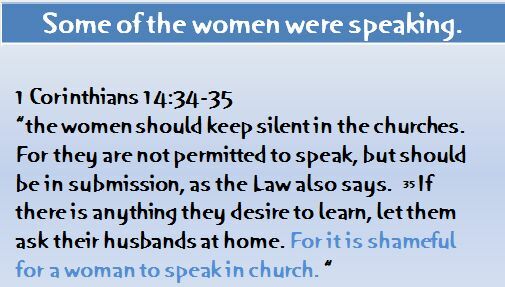 First, I draw your attention to the last part of verse 25, where Paul says “it is shameful for a woman to speak in church.” Now, one problem is that Paul had already given instruction for the wives of the congregation in chapter 11. He tells them that they should cover their heads with a veil if they want to pray or prophecy. Praying and prophesying are kinds of speaking. Those kinds of speaking do not appear to be shameful. 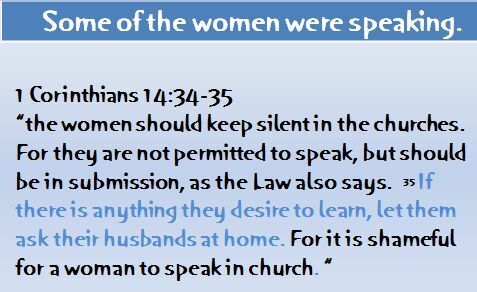 Perhaps what Paul meant was that the Corinthian society saw it as a shameful thing for its women to speak in public. He didn’t say it to the Thessalonians, Ephesians, or even the Romans. But apparently it was a problem in Corinth so Paul orders them not to have their women preach in public. 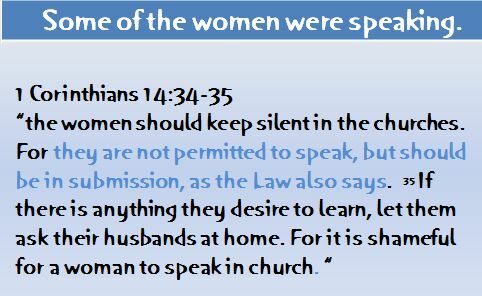 Paul says that the women are not permitted to speak, but should be in submission as the law also says. 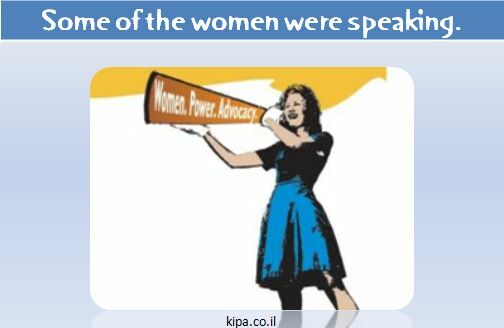 The problem is that there is absolutely no Old Testament commandment against women speaking. But there were plenty of laws in Corinth against women speaking. Paul seems to be saying that the women in Corinth should not speak in public because it is illegal. In fact, history tells us that there was only one class of women who dared to speak in public in 1st century Corinth: the professional prostitutes. These were also the only Corinthian women of marriageable age who dared to appear in public without a veil. To understand Paul’s advice here we have to ask three questions. 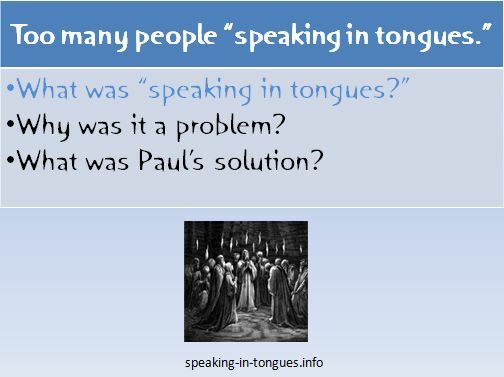 First, “What was “speaking in tongues?” I realize that there is a whole theological tradition that suggests that “speaking in tongues” is some kind of supernatural language that God gives believers to edify themselves with. But I suggest that the problem in First Century Corinth was simply this: people were coming to worship services and giving their messages in languages that most of the other worshippers did not know. He tells the tongues speakers the same thing he told the women, and for the same reason. The wives questioning their husbands was causing distraction and not edifying anyone. The tongues speaking (without a translation) was doing the same thing. 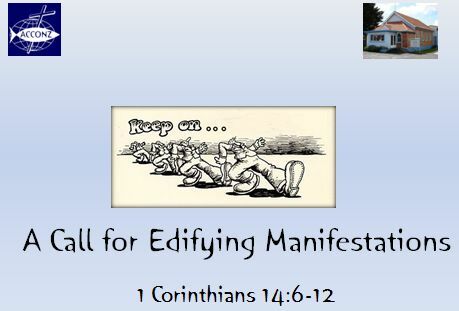 So Paul says “stop doing that.” The goal of all the manifestations of the Holy spirit is to edify the body of Christ. If what you are doing is not achieving that goal, you have no business doing it. 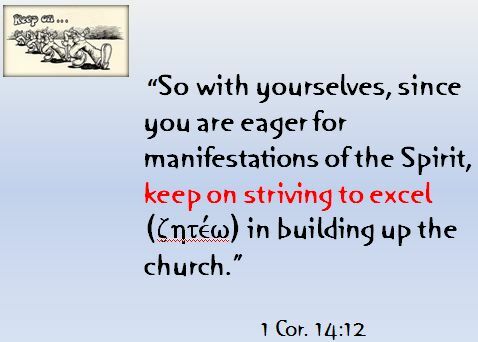 I want to conclude by going back to verse 12, where Paul encourages the Corinthians to keep striving to excel in building up the church. That is the BIG IDEA that Paul is trying to get across in chapters 12-14. May we never forget that. We need to constantly evaluate ourselves to see if the things we are doing when we meet together are actually building up the body. If First century Corinth could have problems – even after being founded by Paul himself – then we have no reason to assume that 21st century Takanini is immune. LORD, before we say anything in church, help us to ask ourselves “will this help the people who hear it?” If it will not help, give us the consideration and love to keep our mouths shut!” Amen. This message is part of a series highlighting the continuous active commands of Paul. It was preached Sunday, 22 August, 2010 at Takanini Church of Christ, in Auckland, New Zealand.